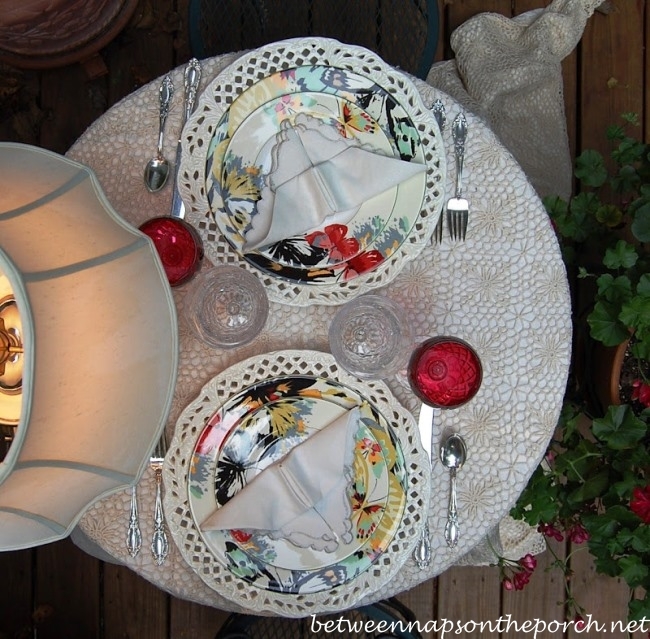 Welcome to the 156th Tablescape Thursday! Tomorrow, August 18th, Between Naps on the Porch turns 3 years old. The last three years have flown by so very quickly. Thank you for visiting and being here every day. I appreciate so much that you share your time with me! Let’s have dinner on the deck tonight. It feels so nice out. I’ll pour the wine…you just sit and enjoy. 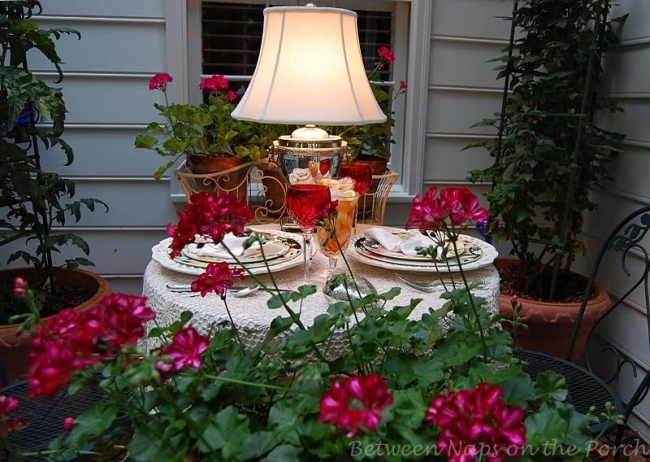 So romantic, dining surrounded by flowers. I decided to do something a little unexpected in the table setting. I brought a lamp out onto the deck. Instead of candlelight, we’ll be dining by lamplight. It’s times like this that I’m really glad I had all those extra outlets installed on the porch and decks when they were added. For this table setting, I created a Butterfly Napkin Fold. You’ll find the tutorial for this Butterfly napkin Fold here: Butterfly Napkin Fold Tutorial. Getting darker now. China used in this tablescape is Mikasa, Modern Butterfly. 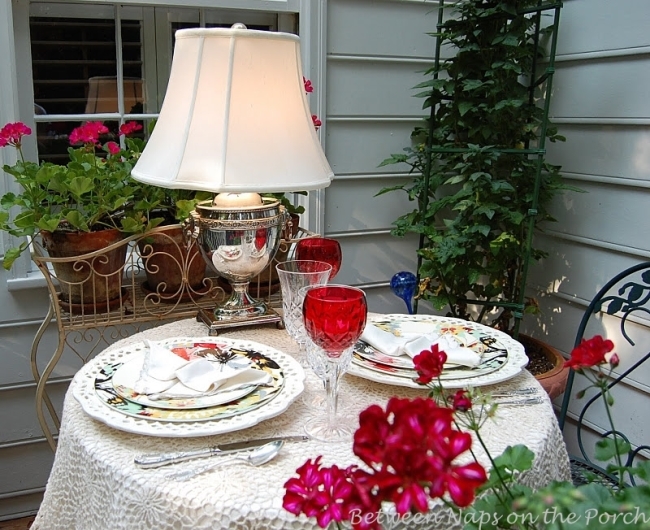 If you love this butterflys, you’ll find another table setting using the same china here: Romantic Table Setting on the Porch. For additional table settings, click on the category “Tablescapes” at the top of the blog. Now THIS is the way to relax outside!!! Beautiful, intimate, quiet, elegant….the perfect way to unwind and enjoy. I LOVE the butterfly napkin fold, and you chose the perfect napkin to do it! I look forward to the tutorial. I really like the lamp on the table, too. I'm a huge fan and user of lamps on the table for ambience as well as the utilitarian purpose they serve. Beautiful table! Love that napkin fold….can't wait to see. Perfect with your china. Susan, Congratulation on 3 years of blogging success! Thank you for the wonderful inspiration, great posts and wise advice over that time. You are the best! I wish you many many more years of blogging adventures! Hi Susan! I would love to have a glass of wine with you this evening on your lovely deck! 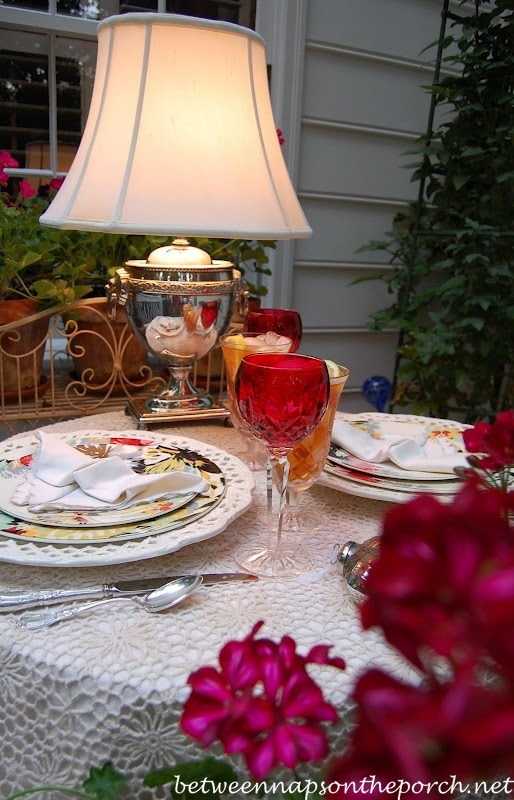 Your table setting is stunning and what a beautiful August evening for an outdoor supper. Thanks for hosting. Congratulations on three wonderful years! And thank you for three wonderful years and the joy you have brought to my life with your posts and the community of dish lovers you have inspired. Happy Anniversary, Susan! May BNOTP continue to be an enjoyable adventure for you for many years to come! Save a place for me. so beautiful with the flowers. love the napkin fold like a butterfly. The dishes are so inviting. Susan… congratulations on your 3 year anniversary. I am so glad I found your blog. I enjoy every post! Your table looks so inviting… only here in South Georgia we'd need a fan for the gnats! Beautiful! Beautiful! 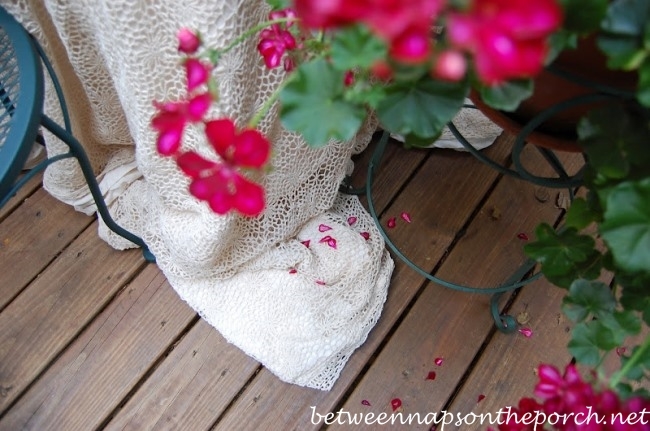 Love the geraniums too! Can't wait to see the butterfly napkin tutorial! So pretty and romantic! Just lovely! The butterfly napkin fold is just perfection! Susan, so very simple yet so beautiful! What a perfect intimate setting. Thanks for sharing. Wishing you the very happiest happy anniversary! I'm so glad I have gotten to "know" you and witness all your many talents. I have learned a lot! Thank you for being such an inspiration to me! 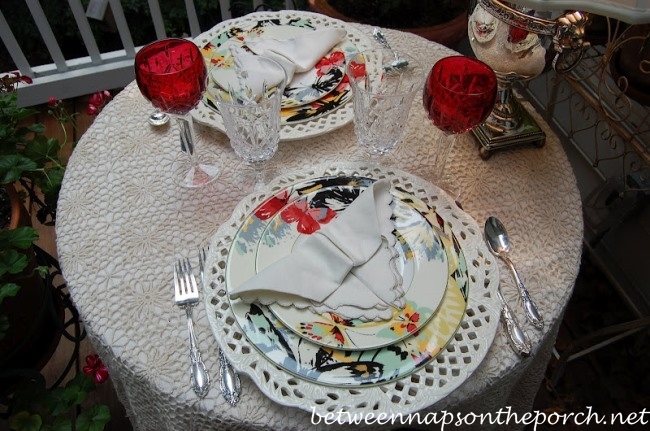 Such a sweet setting..I love the butterfly napkin and the butterly dinnerware! The lamp adds a romantic touch as does the draped lace tablecloth….so sweet! Happy 3 year Anniversary in blogging! You've created quite a following! It's always a joy to see what you come up with! I just love your table for two! I especially love the lamp and lighting. 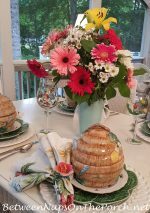 I have enjoyed participating in Tablescape Thursdays the past few weeks…thanks for bringing so much inspiration! First of all congratulations on your three years of wondeful blogging. 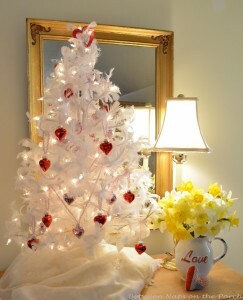 You have inspired me so much with your decorations, ideas and writing. I hope more years to come. 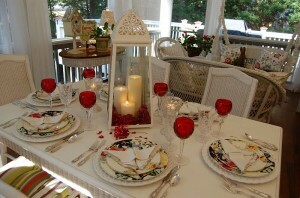 The table on the deck is beautiful aswell, loved the china and the silver lamp on the table looks so romantic. Lots of hugs and kisess. Congratulation on your three year anniversary! Lovely table, it gives me a warm fuzzy feeling. 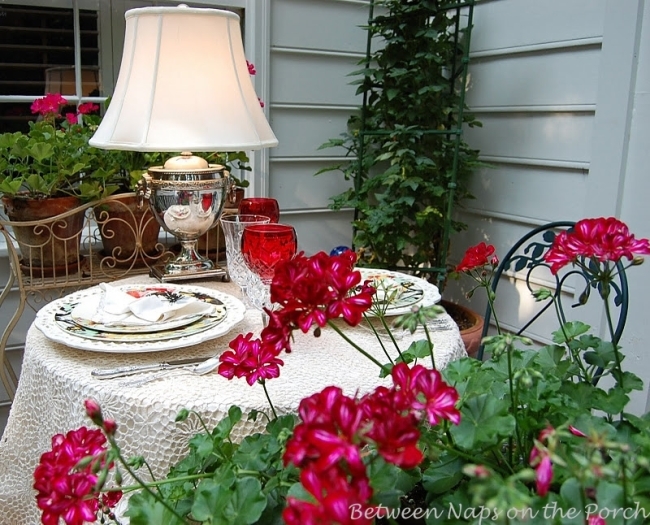 What a truly lovely table.. so very romantic. I love the Mikasa dishes in this setting. So pretty with the crystal and silver. thanks for hosting a wonderful meme! xo marlis.. oh and great job on the piping. Oh, my, that's a lovely sight! Congratulations, Susan! 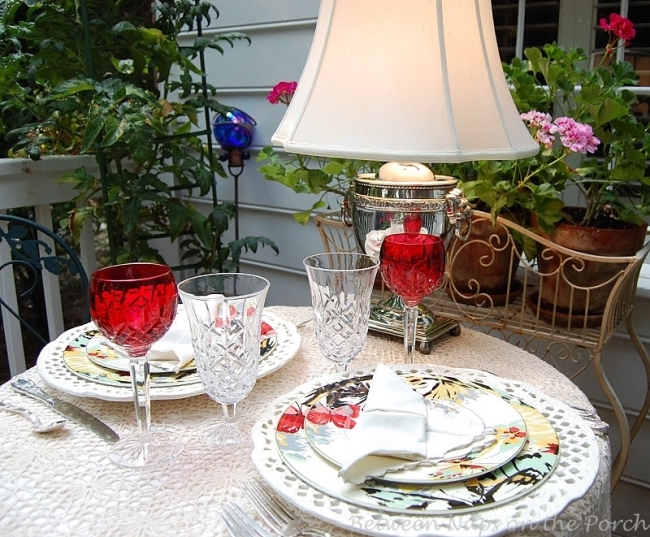 Your table for two is very romantic with the lace cloth and the beautiful butterfly dishes. I'm envious of all your beautiful geraniums still in bloom. Mine are all gone with our dreadful heat. I missed the first few months of your blogging life, Susan, but once I stopped by that very first time, I was hooked — on BNOTP and on giving blogging a try. It was because you made it all look like great fun, exciting and effortless! As folks in the South used to say, "Boy howdy!" Effortless? For me, not so much, but fun and gratifying? Definitely! Thank you for the divine inspiration you've provided, Susan. I'm grateful for your guidance, encouragment, and, most of all, for your friendship. You could have told us it was a hand-crocheted family heirloom, and we wouldn't have had a clue! I also loved the use of the elegant lamp. I watched a film set in 1940s London the other day. The tables in a restaurant all had electric lamps sitting on them, and I thought, "How beautiful; I need to do that for Tablescape Thursday!" If I ever get around to doing it now, I'll have two sources of inspiration — Susan of BNOTP and the set decorators of an Oscar-nominated film! Congratulations and very best wishes, dear friend, on your amazing accomplishments during these first three years! Absolutely stunning! One thing I love about the dry heat here in the west is that it cools down so much in the evening. The colors of the flowers reflected in the table are just gorgeous. Absolutely love this table for two. The lamp is awesome. Love the butterfly china, can't wait for the tutorial. Pretty tablecloth. I love this party and someday I'll have something pretty to link up to it too. I've linked up the party on our Thursday Linky Party post. HOW romantic. Our son leaves for college on Friday so my husband and I will be empty nesters…you are giving me ideas. Congrats on three years of blogging! I am so happy you took the plunge and started BNOTP and especially TT! 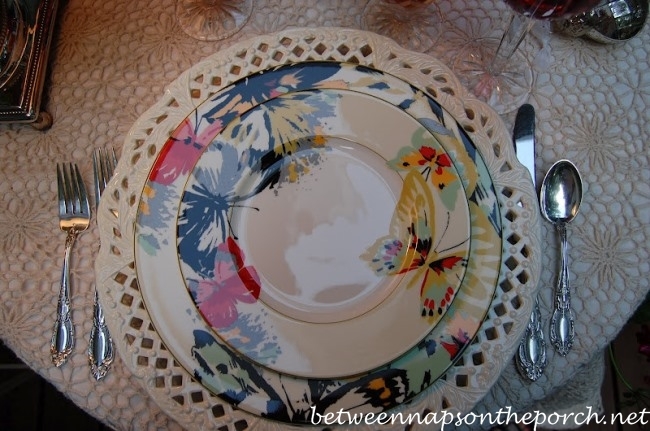 This butterfly themed tablescape is beautiful! I can't wait to learn how to create those napkins. Thanks for all you do, Susan! Such a pretty setting. I love the butterfly napkins. I do hope you will do a tutorial on that if you haven't already. I will have to check to your blog to see if you have. They look so great with you pretty butterfly plates! Thanks for pointing out the youngest tablescaper to join in this week. That is the sweetest thing ever! Oh Susan, I just love this! Everything about this is just so summery and joyful, it just makes want to set a lovely table for two outside! Thank you as always for all your wonderful inspiration you give us each week! PS Tayla's tablescape is darling! It's always fun to see what you will come up with next! I adore the table for two…esp. the lamp! What a beautiful spot for a relaxing meal! I love the splashes of color! Gorgeous. What is the trick with getting your geraniums to bloom and grow. Ours just piddled around and didn't bloom much. We have shade, I think they need lots of sun. Happy Anniversary! I've just published my first blog post and hope I can reach the high standard you've set with your wonderful blog. I love the little table for two. And 3 years of all your table setting !!!!!!!!!!!!! Three years? How can that be?? Thank you so much for providing this lovely spot for us to share, Susan! I love your table and am so envious of eating outside. I am tired of the heat and want some cool nights to enjoy. 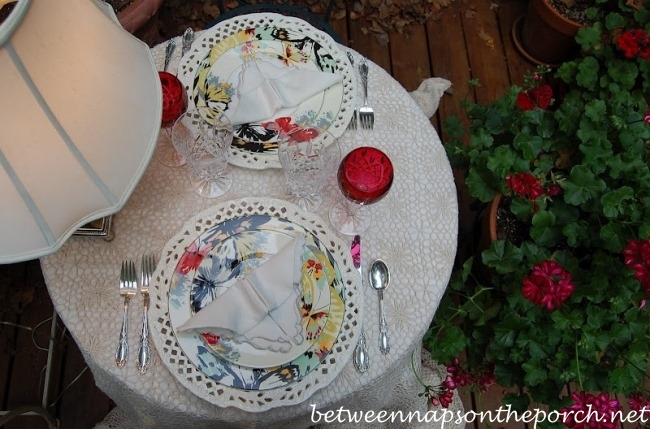 I just love your butterfly napkin folds – so perfect with that lovely dinnerware. Just a beautiful setting… I loved Tayla's setting too but had trouble commenting. How wonderful to see! 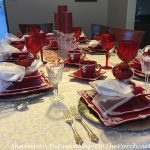 Susan, your tablescape is gorgeous! Such a beautiful outdoor setting, and I love those chargers. Happy Anniversary! Beautiful table as always. 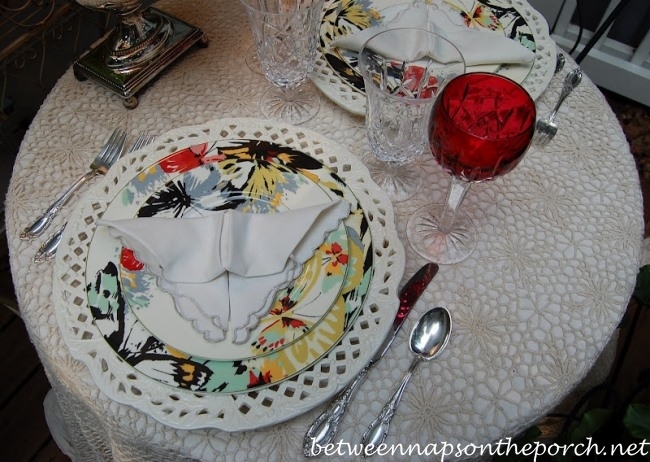 And that butterfly fold napkin — tres magnifique! Thank you AGAIN for hosting this creative avenue for so many for so long. Your tablescapes are always such a treat. One comment…about comments…I would love to leave more comments to those who link to your blog, but don't think some people realize that it can be more difficult for non-Blogger users to do so unless they set up the ability to leave such comment by way of Name/URL selection. Just wanted to let people know that cause I've visited many of those participating here and couldn't leave a message…how sad…their entries are wonderful, but I cannot tell them. Susan, one of my favorites ever. The photos are just beautiful. Just the place I would like to get away from it all for a little while. Great napkin fold. Loved your new red pillows on the porch as well. How cute is little Tayla? What a great family you have. Thanks for the invite, I'll be right over! Looks gorgeous! Great…come join in! 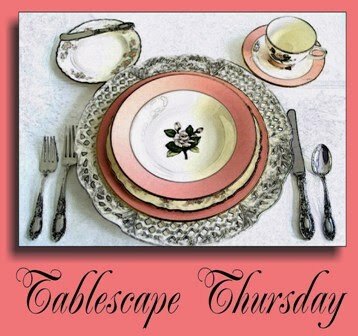 Just click on the header category "Join a Blog Party" at the top for more info about Tablescape Thursday. I want to sit on your deck! So peaceful! Love how you are thinking outside the box with your duvet cover. Thanks for inviting me to your party. This is just perfect! Love the colors, flowers, and especially the butterfly folded napkins. Thanks so much for stopping by my blog to visit. I've added you to my google reader. Just love your blog! 156 tablescapes, and every single one is beautiful? That's incredible. Congratulations, and thank you so much for sharing your passion for living a beautiful life. 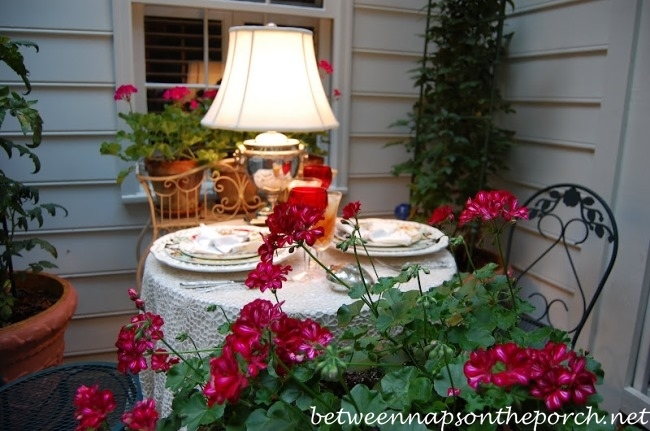 As always, another beautiful southern tablescape! I love how your flowers are cascading onto the floor. I cannot wait to meet you at Rosalyn-Sue's art event at the Country Living Fair in October! 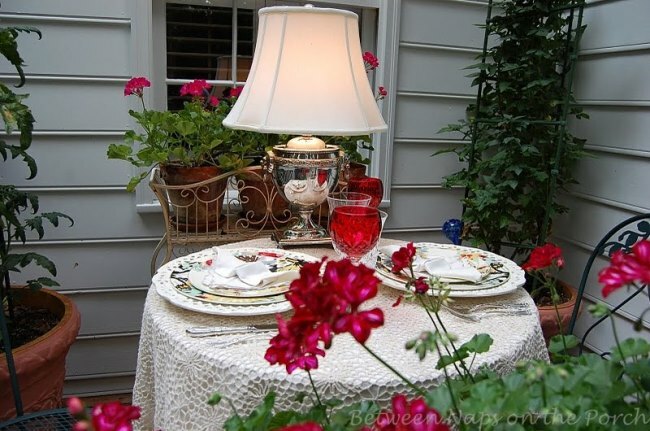 I love the outdoor table with the lamp. It's so romantic. My favorite thing though is your napkin fold. I have a set of Spode dishes from the 1880's that have butterflies and I'd been waiting to get a few more things together before doing a tablescape with them. I finally have everything I need and now, thanks to you, I have the PERFECT napkin fold! Thank you! p/s your flowers look so pretty still! Susan you have a very rare creativity.Wonderfully put dinner table and dinner set. I like so much outdoor dinner place. It looks very romantic. Don't know what I liked better…the butterfly napkins or the silver lamp on the table! What a clever idea to use a duvet for a table covering. It was gorgeous! Well done…as usual! Awww, thanks! Never to late to leave such a nice comment. 🙂 Much appreciated!